(0 Customer Reviews) | Write Review 6 issues per year With its rich blend of stories – covering sea change stories, homes gardens, decorating, food, wine, fashion, health and beauty, travel and motoring – Blue Mountains Life magazine is an all-encompassing lifestyle magazine adored by its readers. Because homes are an essential part of the magazine, we’ve increased the amount of decorating and renovating information. And because we all need to pamper ourselves, we’ve enhanced our fashion and beauty pages. While many other magazines struggle to find a place in the market, our magazine has continued, since its launch in 2004, to grow from strength to strength. Along the way, it has earned the respect of readers who are affluent and educated, discerning and demanding. Blue Mountains Life speaks equally to city and rural dwellers. This is because the magazine delivers a message about a quality of living that all our readers find inspirational. No magazine in the region can boast such a strong readership. As a lifestyle magazine, Blue Mountains Life embraces all the elements that are essential to modern living – and this is reflected in our editorial mix which extends from homes to fashion to beauty to food. 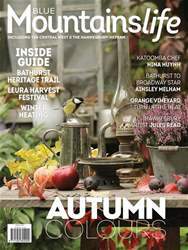 Blue Mountains Life magazine is the premier publication with its intoxicating blend of stories on this magnificent rural region that includes Bathurst, Orange, Hawkesbury and of course the Blue Mountains. Features include people, homes, gardens, interior/exterior decorating, food, wine, fashion, health, travel and motoring. A bold and glossy, large-format magazine that delivers the who, what, when, where, why and how of one of Australia’s most affluent regions. Stunning photography and quality journalism all in one publication. With its rich blend of stories – covering sea change stories, homes gardens, decorating, food, wine, fashion, health and beauty, travel and motoring – Blue Mountains Life magazine is an all-encompassing lifestyle magazine adored by its readers. Because homes are an essential part of the magazine, we’ve increased the amount of decorating and renovating information. And because we all need to pamper ourselves, we’ve enhanced our fashion and beauty pages. While many other magazines struggle to find a place in the market, our magazine has continued, since its launch in 2004, to grow from strength to strength. Along the way, it has earned the respect of readers who are affluent and educated, discerning and demanding. Blue Mountains Life speaks equally to city and rural dwellers. This is because the magazine delivers a message about a quality of living that all our readers find inspirational. No magazine in the region can boast such a strong readership. As a lifestyle magazine, Blue Mountains Life embraces all the elements that are essential to modern living – and this is reflected in our editorial mix which extends from homes to fashion to beauty to food. You'll receive 6 issues during a 1 year Blue Mountains Life magazine subscription. 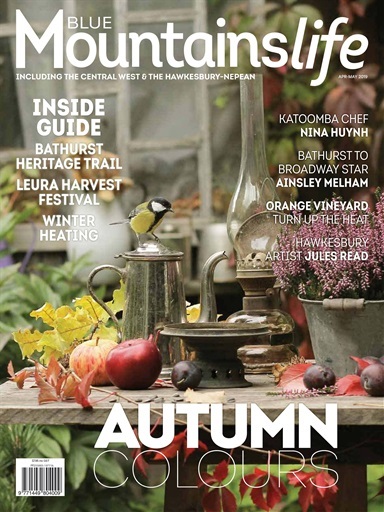 You'll receive 6 issues during a 1 year Blue Mountains Life magazine print subscription.